Damage at Saipan's airport is shown after Super Typhoon Yutu hit the U.S. Commonwealth of the Northern Mariana Islands, Friday, Oct. 26, 2018, in Garapan, Saipan. Residents of the U.S. territory are preparing for months without electricity or running water after the islands were slammed Thursday with the strongest storm to hit any part of the U.S. this year. Used to riding out monster storms, about 50,000 people living in the U.S. Commonwealth of the Northern Mariana Islands expect to be without electricity and running water for months after getting slammed by the strongest storm to hit the U.S. this year. Officials toured villages in Saipan and saw cars crushed under a collapsed garage, the ground ripped clean of vegetation and people injured by spraying glass and other debris. As of Friday local time, there was one storm-related death confirmed. Mangkhut's effects turned out to be not as bad as expected, so those supplies are still available. Gregorio Kilili Camacho Sablan, the territory's delegate to Congress, said residents will need significant help to recover. Colleagues in Congress have offered aid. Sablan expects a presidential disaster declaration to free up resources for storm relief. "We want people to remember we are Americans and we exist," local lawmaker Edwin Propst said. Residents "were stoic and still smiling and they were just thankful to be alive," said Propst, a member of the territory's House of Representatives. 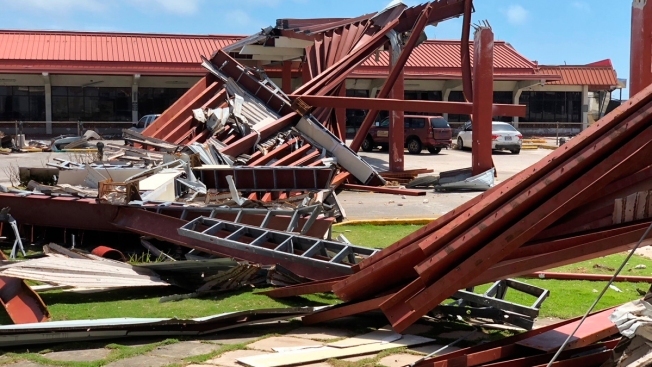 Sablan said most of the structures in the southern part of Saipan lost their roofs and many, including a high school, were "completely destroyed." On the smaller island of Tinian, which took a direct hit, most of the houses were destroyed, and even some concrete ones were reduced to rubble, resident Juanita Mendiola said. The storm ripped a door of its hinges and flung it more than 100 feet away into a pigsty, she said. More than 800 people were in shelters across the territory, and space was running out, officials said. Electricity and running water shut down Wednesday, residents said. Cellphone coverage was spotty. Nadine Deleon Guerrero, a spokeswoman for the territory's emergency management department, said all of Saipan (population 50,000) and Tinian (population 3,000) islands were without utility power. Crews were still assessing how long it will take to restore electricity, she said. Commercial flights won't be operable for some time, she said. 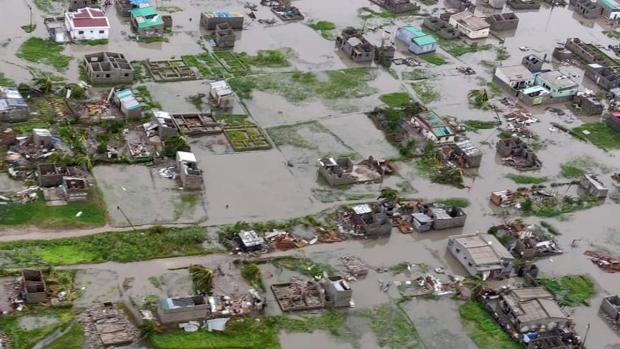 Terminals, the tarmac, runway and equipment all suffered damage. Hunter said he doesn't expect to get power back for months, recalling how it took four months to restore electricity after Typhoon Soudelor in 2015. Propst, the lawmaker, said he has lived through dozens of typhoons, but "this is the first time I feared for my life." Amber Alberts said she was feeling like "one of the lucky ones" after safely riding out the storm in the kitchen of her apartment. "My place is fine, my car is fine," she said Friday as she set out to find ways to help.